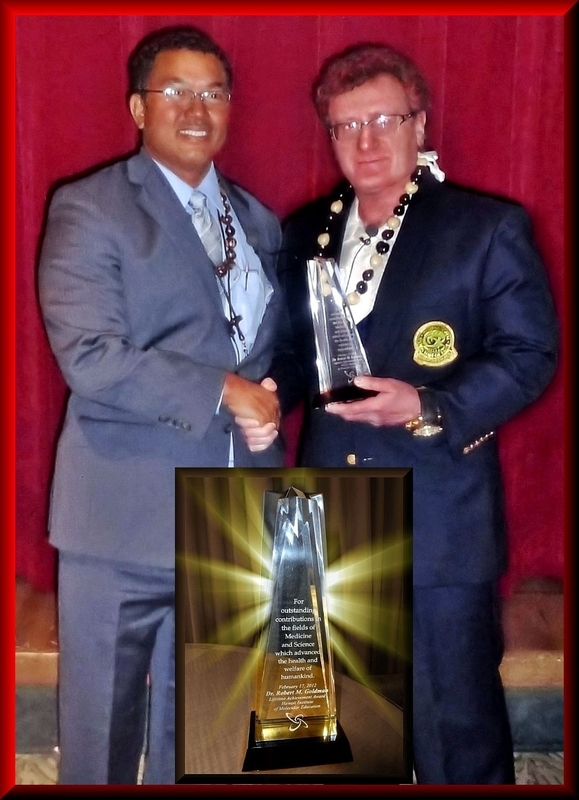 HONOLULU HAWAII (Feb 17, 2012)-Dr. Robert M. Goldman, anti-aging medicine pioneer, and co-Founder of the American Academy of Anti-Aging Medicine (A4M) (www.worldhealth.net), the world’s largest preventative medical society, was conferred with the ‘Lifetime Achievement Award’ in Medicine and Science, commemorating a lifetime of distinction, at the breakthrough First Annual World Congress: Understanding The Molecular Basis of Heart Disease and Cancer, held February 17, 2012 in Honolulu, Hawaii. Present were renowned international scientists presenting groundbreaking discoveries in understanding the molecular basis of heart disease and cancer. Dr. Goldman (http://www.DrBobGoldman.com, http://www.waaam.net/robert_goldman.php), an accomplished scientist, pioneer in Anti-Aging Medicine, Founder & Chairman of the International Sports Hall of Fame (www.SportsHOF.org) and world-class athlete, has earned international distinction, including numerous sports listings in The Guinness Book of World Records. Dr. Goldman serves as Chairman of the International Medical Commission overseeing sports medicine committees in over 184 nations. He also is President Emeritus of the National Academy of Sports Medicine and served as Chairman of the Junior Olympics and Master Olympics Sports Medicine Committees, overseeing sports/health programs for millions of athletes. This is just what i was looking for. On top of that if your website has a page rank, the more profit you’ll make. Nice. Argan oil is on things that many people do certainly not literally know a lot regarding. Its kind of a mystery oil that people merely buy. Adequately we have the actuality regarding products that include argan oil. So come by our site. Eat healthy and try to stay out of jail.